A CONSIDERABLE avalanche danger exists at all elevations in the backcountry as a quick-hitting storm deposited 2+ feet of new snow yesterday. A CONSIDERABLE danger means human triggered avalanches are likely. In today's case, these are 2-3' storm snow slabs that could propagate across entire slopes. We are all powder starved, but patience is the key. We need to give the snowpack time and let the new snow adjust before venturing into the steeper terrain. **Expert level terrain management skills are necessary for avoiding avalanche terrain and having a safe day in the backcountry. Areas to avoid are slopes 35 degrees or steeper and include terrain traps such as small cut banks and gullies in the trees - such as those found in the Tincan Trees. After waiting for months and months we finally got a true shot of winter yesterday on Turnagain Pass! A fast moving storm moved in late Sunday and by the time it moved out yesterday evening (24-hours later) we had over 2' of new snow. The new snow came in with very strong Easterly winds and those have died down as well. As far as new snow amounts? Below is a rundown on storm totals. Turnagain Pass (1880') 22" snow / 2.0" water Turnagain Pass 26-30+"
Alyeska Mid (1700') 16" snow / 1.3 water Girdwood Valley 18-22+"
Summit Lake (1400') 13" snow / 0.9 water Summit Lake 14-16+"
Although visibility was hampered yesterday, we were able to see a few debris piles at the bottom of gullies pointing to natural avalanche activity occurring above. Several human triggered slides occurred as well in the Tincan Trees, photos below. Today, the storm is past and natural avalanches are not likely, but human triggered avalanches are and this is the most dangerous time for skiers and riders. If the skies clear enough for travel above treeline, managing terrain will be essential. This means sticking to slopes 35 degrees or less and staying out from under slopes or steep gullies and terrain traps in the trees. 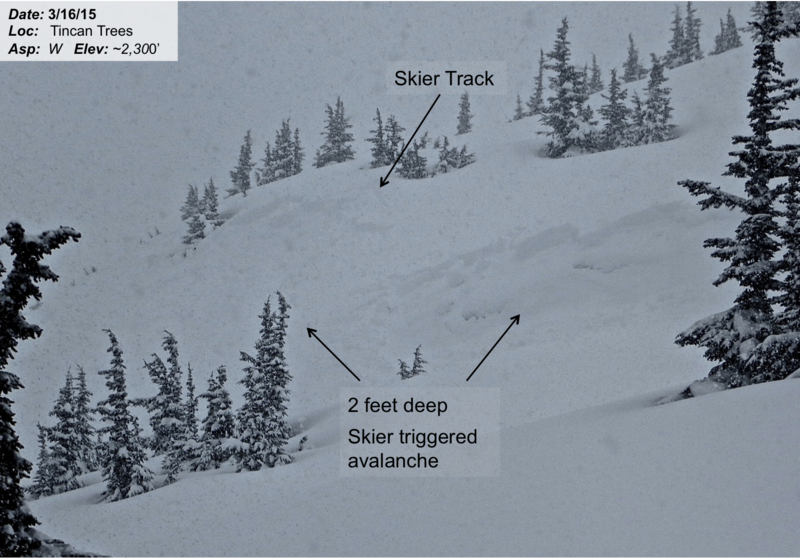 Photos below are of two skier triggered slab avalanches in the Tincan Trees yesterday. Report from yesterday is HERE. Certain slopes harbor faceted snow under the 2' of new snow and this set-up (photo below) will allow for remotely triggered slides and the potential for triggering an avalanche from below. Although not all slopes have this layering, we are still too close to the tail end of the storm to jump into steeper terrain in general. Yesterday was the first bona fide storm snow day of the season, believe it or not!! The storm began Sunday night and peaked mid-day yesterday with snowfall rates exceeding 2"/hour and a storm total of 22" at the Turnagain Pass SNOTEL. 24-hour totals are below in the charts. Easterly ridgetop winds peaked mid-day as well with averages as high as 65mph and gusts in the 80's. Temperatures hovered in the mid to upper 20's on the ridgetops and near 32F at 1.000' (just enough for damp/wet snow in the parking lots). The storm moved out yesterday evening and overnight skies have cleared and winds have died down. Today, this short break will be replaced by another system headed our way late tonight. Skies should remain mostly cloudy with a few flurries through the day while winds will continue from the East in the 15mph range. Temperatures will be on a slow rise, up to 30F at treeline and the upper 20's on the ridgetops. The pattern responsible for our return to winter is a large complex low South of the Aleutians, which has a series of embedded disturbances tracking Northward through the Sound and into Southcentral. This pattern will continue through the week and bring additional snowfall. The rain/snow line should be around 1,000' and possibly higher tomorrow. Storm Day at the Pass! !